We have established the Puerto Rico Hurricane Relief fund to assist with emergency assistance and basic needs of those affected. 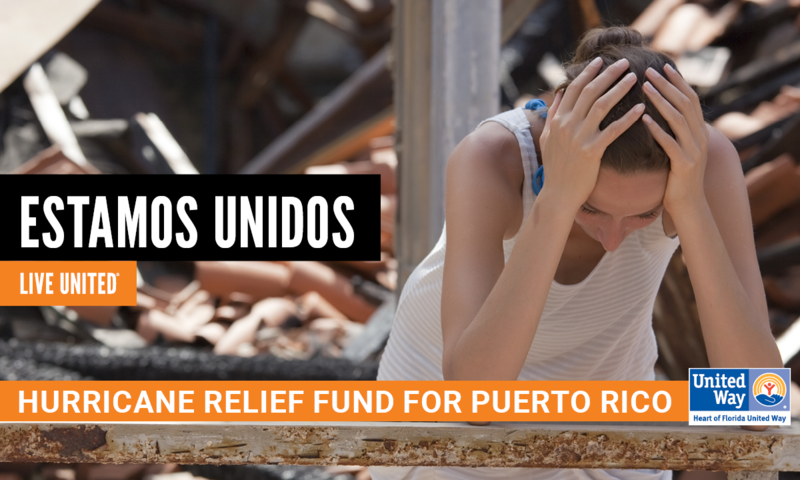 100% of every dollar raised will go toward alleviating immediate storm-related needs in Puerto Rico, long-term community recovery and displacement assistance for families in Central Florida. 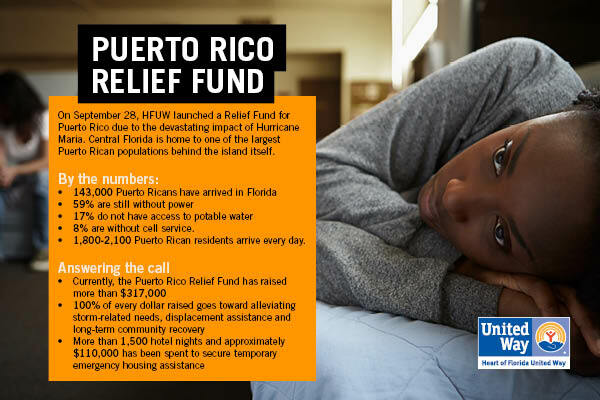 We have been in contact with Fondos Unidos de Puerto Rico, the United Way that serves the entire island, in order to assess the immediate needs of their community. Thank you to all of the individuals and organizations who have supported our efforts in providing hurricane relief. Orlando has one of the largest populations of Puerto Ricans outside of the island itself. When Hurricane Maria ripped through Puerto Rico, causing havoc and destruction, they weren’t the only ones affected. As an interwoven part of our community, we will not sit idly by when our friends and family in Puerto Rico need our help. Fondos Unidos is in the process of restoring operations to begin recovery. We will support and assist our sister United Way in their efforts. In addition, Central Florida is expected to see an influx of those who have been displaced fleeing to our community. The fund will also be used to help those who have been displaced and the families who are taking them in. Are you brave enough to go Over the Edge? A Tasteful Way to Make a Difference! © 2019, Heart of Florida United Way. All Rights Reserved. NEW SOLICITATION DISCLAIMER: A COPY OF THE OFFICIAL REGISTRATION (CH214) AND FINANCIAL INFORMATION MAY BE OBTAINED FROM THE DIVISION OF CONSUMER SERVICES AT www.800helpfla.com OR BY CALLING TOLL-FREE (800-435-7352) WITHIN THE STATE. REGISTRATION DOES NOT IMPLY ENDORSEMENT, APPROVAL, OR RECOMMENDATION BY THE STATE.